Ever stared up at the stars in wonder at the vastness of the universe? Then lifted your camera to capture the moment only to find a blur of lights or just the darkness of the night sky in your shot? This is where photographer Graham Cowan comes into the picture. 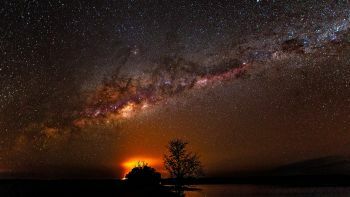 Cowan will run a series of astro photography workshops in Darwin and Katherine in April and early May, where he will share tricks and tips to capturing the Milky Way through a camera lens. Off The Leash caught up with Cowan to pick his brain before the workshops. Anyone who enjoys photography - from mums and dads, to people who go out camping and want something else to do other than fishing or drinking. With so much information on the Internet, what are the advantages of going to a hands-on workshop like this? Everything is on YouTube, but quite often when people first start out they have no idea what search terms to use in relation to some-thing as simple as shutter speed or aperture or how that works in capturing and exposing your photos properly. So what are your top tips for beginners? It’s all about learning and reading your camera. Photography is generally about your aperture and your depth of field - what’s going to be in focus and how that works in your camera. Where are the best spots to shoot the night sky? Edith Falls is great and I like Fogg Dam - it’s nice and close to Darwin and there’s zero light pollution. Also the termite mounds at Litchfield can make a nice shot as well. What is so appealing about night photography? I can go out and no two nights are the same. At Litchfield there was a huge fire coming through, I was worried my friends and I were going to get caught out, but the fire in the photo with the termite mounds made for a really nice photo. Sign up to our electronic mailing list to receive the latest events news.